It's a good thing hamsters are relatively healthy creatures. With their high metabolism and fragile nature, a propensity for illness would be devastating to them. This would be especially true for those in captivity where they are in contact with many more pathogens than they would normally be exposed to in the wild. Because of their hardiness, they have made excellent lab study animals and great pets. When you see how seldom hamsters get sick, you might believe that their constitution is very strong and can fight off illness with no help. The truth is that their metabolisms are so very high that most illnesses a hamster might get can kill them before we have time to react. For this reason, as a hamster owner, you must be observant of your hamster's habits and physical traits so that any change or unusual occurrence can be identified quickly. Hamsters are usually healthy and can stay that way their whole lives if we are willing to follow some guidelines. In this issue I will mostly be dwelling on prevention. In later issues I expect to cover some specific ailments that your hamster might contract. Keeping a cage cleaning schedule is important. Hamsters will suffer from stress if either their cage is cleaned too often or not often enough. If you don't clean enough, the hamster's natural cleanliness instinct is thwarted. He'll soon not be able to tell his toilet from his nest because everything will start to smell the same. If you clean too often, ironically he'll have the same problem. He won't find any of the scents he used to mark certain territories. A routine cleaning schedule is probably more important than cleaning his cage sometime during the week. Get your hamster used to a cleaning routine and stick too it. Try to make him as comfortable with his cage after a cleaning as possible. The first thing you need to do before handling your hamster or cleaning his cage is wash your hands. There are illnesses that hamsters can get from us and some we can get from them. Hand washing is the best way to avoid these. Many books will tell you the whole cage and all his toys need to be scrubbed and disinfected at each cleaning. I don't believe this is entirely necessary. The reason is simple. 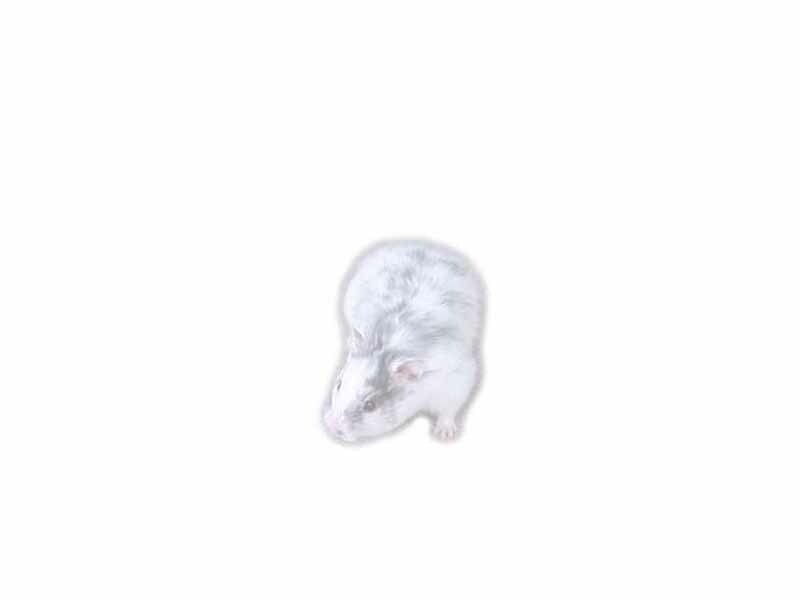 Hamsters are creatures that rely on scent. Campbells Dwarves, for instance, have 6 types of olfactory markers they use. If you clean off all the scents in the cage, you are removing his territorial markings every time you clean. This causes an amazing amount of stress for the animal and stress can lead to illness. So what I do is pick some things in the cage that I don't clean; each time it is usually something different than at the last cleaning. Also I keep some of the cleanest nest bedding to place back into the cage when the cleaning is done. I clean my cages every other week. You may want to clean every week. Just use common sense when it comes to cleaning. Remember, you are cleaning for your hamsters health and not, as some people think, to keep the smell from becoming too thick around the cage. Reducing the odor is a side benefit of cleaning. Hamsters don't mind their own smell. You may be tempted as I was when I first started raising hamsters to get a large water bottle so your hamster won't run out of water and so you don't have to refill the water as often. The rule is to change your hamster's water every day. This is important to keep bacteria from breeding in the bottle and to keep the water nozzle from getting clogged. You may want to get instead a bottle that is a practically sized for your hamster and his cage. Choosing a place for your hamster's cage is an equally important decision. It should not be in a drafty location. The temperature should remain between 65 to 85 degrees Fahrenheit and not fluctuate by more than about 4 degrees in 24 hours. Under some conditions 65 can be too cold for a syrian hamster causing them to hibernate. We'll talk about this more in a later issue. Diet is perhaps the single most important factor which determines how healthy your hamster remains. Again, as with the cleaning, a routine is important. I find nightly feedings are the best. This way hamsters are usually up and ready to eat, and you have more of a chance to interact with your hamster. Most health problems can be avoided with the proper diet. Hamsters need to have a balanced hamster mix as a staple in their diet. These are mixes of grains and seed specifically selected to give a hamster the right amount of crude fiber, protein, and fat. Don't get rat or mouse food for a hamster. Fortunately, there are many good hamster mixes out there. Find one you like and stick with it. For syrians put two tablespoons of dry mix in his bowl every day. Empty the bowl before you fill it. The fact is that I clean my food bowls and water bottles very often &#151; nearly every day at feedings. Contaminated food can be a killer. Dwarves are small enough to sit in their bowls to eat, and all hamsters bury their food at times. For dwarves one tablespoon per hamster is fine. Too much of a good thing can be bad for a hamster. So if you see that your hamster is getting fat on this diet, you may have to remove most of the high fat seeds like sunflower seeds which can be saved as treats. It's also important to give your hamster fresh foods with the mix about every three days. This keeps the hamster from becoming constipated or obese. Don't feed him these foods too often. You don't want any lying around so after couple of hours you should remove uneaten portions. You also don't want to give him so much he feels compelled to store any fresh food away where it can rot. Anything you feed your hamster that is fresh needs to be completely clean so wash it first. Here is a list of things that a hamster can eat as fresh food: Apple, asparagus, banana, broccoli, calarese, cantaloupe, carrots, cauliflower leaves and stalk, celery, chard, chestnuts, chicory, corn on the cob, courettes, cress, cucumber, grapes, green beans, kale, marrow, parsley, pear, peas, strawberries, sweet corn, water chestnuts, watermelon. Also egg, bread, crickets, mealworms, and raisins are good healthy treats. Now remember, do not feed any of these good things too often. They can cause diarrhea in quantity. If you suspect constipation or if your hamster is gaining excess weight (and is not pregnant), feed more of these veggies and things. If your hamster is pregnant, feeding them fresh foods more often is actually a good thing, especially the apple which can help avoid a number of birthing problems as well as improving the health of the litter. Things you should avoid giving to you hamster: Lettuce, cabbage and brussel sprouts since they will cause gastritis, bladder trouble, and in the case of lettuce, liver or kidney problems. Also avoid tomato, pickles, chocolate, orange, potato tops, rhubarb, onion and garlic since acidic foods are not good for your hamster. Steer away from any excessively sticky foods as these may gum up the hamster's dry pouches and may actually cause a pouch to become impacted. Exercise is important too. If you don't have a wheel for your hamster, see to it that he gets out of his cage and is allowed to move around under your supervision. The movement is important to his digestion and can help avoid constipation. The exercise also helps to relieve stress which as I mentioned earlier can cause illness if allowed to escalate. Another component of exercise a hamster needs is something to gnaw on. Without this his teeth can over grow making it impossible for the hamster to eat. There are chews available at pet stores but there are plenty of things you can find around the house that will work just as well. Clean fruit tree branches, toilet paper tubes, or dog biscuits will work. I even use metal spoons which my dwarves seem to like better than anything else in their cages. Nylabones from the pet store are another good choice. Always pay attention to the hamster's teeth, fur, eyes, underside, and habits. Sometimes a little change in these can indicate illness before it goes too far. As always, if you suspect something is wrong with your hamster, it's best to get him to a vet right away rather than trying to diagnose the trouble or waiting to see what develops. The sooner a hamster receives treatment the better chance there is for a complete recovery. So remember the guidelines for hamster health: environment, diet, and exercise. If you pay attention to these, your hamster will remain healthy and happy. Next time, we will be discussing some specific simple ailments and what treatments you might be able to provide.